Iowa head coach Fran McCaffery hit a home run the last time he reached into Ohio to sign a player, securing a commitment from class of 2011 forward Aaron White, a player that many of the top Big Ten programs didn’t want. White has gone on to have three very good years for the Hawkeyes and now, McCaffery will try to do it again, this time with a much more prominent program intact, as his team got a verbal pledge from an Ohio rising senior on Sunday afternoon. 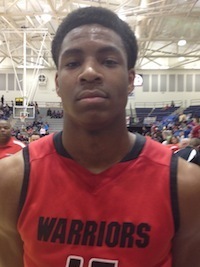 Huber Heights Wayne power forward Ahmad Wagner became the fourth class of 2015 prospect from the Buckeye State to commit to a Big Ten program when he chose the Hawkeyes. After a tremendous junior season at Wayne, located in suburban Dayton, Wagner also was effective for his All-Ohio Red club team in the Nike EYBL, helping him earn even more interest from both mid and high major schools alike. In the end, Wagner chose the Hawkeyes, one of the Big Ten’s up and coming programs, over other offers from Minnesota, Texas Tech and several MAC and other mid-major offers. Additionally, Wagner did not have offers, but had received varying levels of interest from schools like West Virginia, Butler and Stanford. A hard-nosed forward who stands around 6’7 but plays much bigger, Wagner is a high-effort guy who really competes on the glass. As a prospect who also starred on the football field, Wagner has a college ready body with good strength and athleticism, which helps negate his lack of height inside at the high major level. More skilled than he often gets credit for, Wagner is a good mid-range shooter, a strong finisher inside and has continued to improve his skill-set every year he’s been at Wayne under head coach Travis Trice. Starting with Wagner and Dayton commit Xeyrius Williams, Huber Heights Wayne will be one of the favorites to win the D1 State Championship in Ohio, on a team that also features ’15 PG D’Mitrik Trice, ’16 PG Roderick Caldwell and ’16 wing Trey Landers. With Williams and Wagner both off the board, attention in Huber Heights will shift to the 2016 kids, as well as Trice, who has several low and mid major offers. The commitment of Wagner to Iowa gives Ohio a dozen prospects who have made early commitments to D1 colleges from the 2015 class, in a class that ultimately will see thirty-plus prospects sign at that level.